“Actually, she called it ‘acting weird. '” Singh says. As a result of these false accusations, Mr. Singh was arrested and detained for 30 hours. After being interviewed by an agent from the FBI (through a Punjabi language interpreter), he was cleared of all allegations of wrongdoing. The Potter County Attorney’s Office also declined to press any charges. 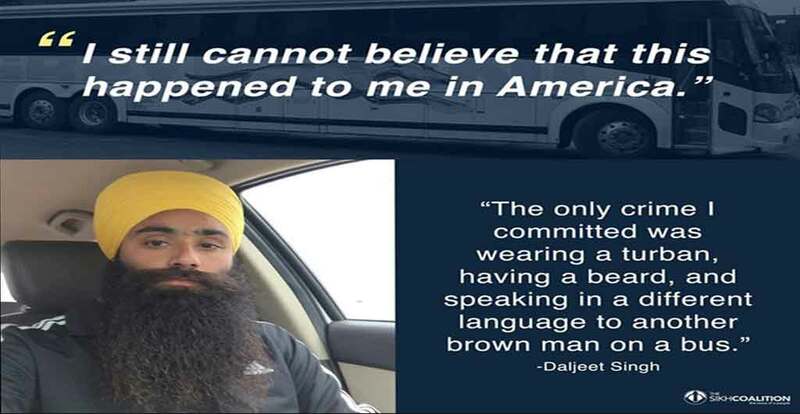 Mr. Singh believes that the passenger who reported him to the police, Tianna Lynn Decamp, and the passengers who detained him, Anthony Lamar Lillie and Kelly Michael Morris, targeted him solely based on his race, his religious appearance — namely his Sikh turban and beard — and the fact that could not speak English. He believes their actions were not based on any reasonable suspicion of wrongdoing on his part. Read Mr. Singh’s statement and full account of the incident here. The Sikh Coalition, which is representing Mr. Singh, is calling on the Porter County Sheriff’s Office and the Potter County Attorney’s Office to file criminal charges against Decamp for knowingly reporting a false and baseless bomb threat. They are also requesting that criminal charges be filed against Lille and Morris for unlawfully restraining Mr. Singh on the bus. Read The Sikh Coalition’s full complaint here. “I have suffered significant psychological and emotional harm, anxiety, sleeplessness, and distress as a result of the profiling, my arrest and detention, the removal of my turban, the subsequent media coverage, and the defamation of my name and character,” Mr. Singh says.